The OPI Designer Series are polishes I have a serious love for. I own all but 5. I would love to own them too some day. I've looked for them on ebay and they're either non existent or ridiculously priced. Once in a while I do some dusty hunting so I'm hoping to find them one lucky day. In the mean time; today I'm wearing OPI DS Titanium. OPI Designer Series Titanium is a deep grey (titanium?) with silver glitter, irridescent flakies aand silver holographic glitter. It dried to a matte finish which is not surprising at all since the last two releases in the Designer Series were matte finish too. I did two coats, but decided I wanted shiny, so I did top coat as well. This falls releases are not super amazing for me this time around. They're pretty and of course I needed them for my collection, but they do not really blow me away. I think I'll wear this again and leave it matte to see if I feel differently. 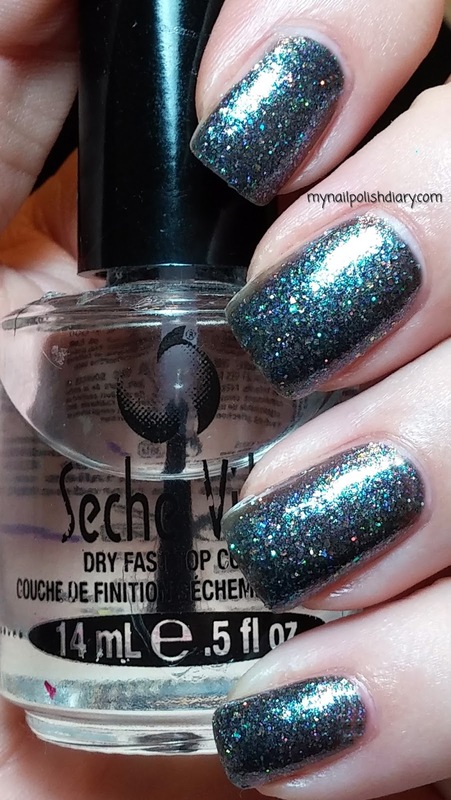 Even though I'm not in love with this, it'll be a great polish for the weekend since I think it will go with anything.